Click HERE to watch a video and learn about the great new features! Stitcher's Quest has just received notice that our early order of the B790/B880 Upgrade has been shipped. This first order is in a very limited quantity and we will only order additional as needed. Advance payment is required. The introductory price is $699 - a $200 savings - and good through the Back-To-School Financing Sale August 17-21! If you have a B 880 or B 790 this is the best way to get all the new features that will soon be available on the new B 880 Plus and B 790 Plus. Embroidery Plus upgrades the B 880 & B 790 to enhance embroidery functionality. 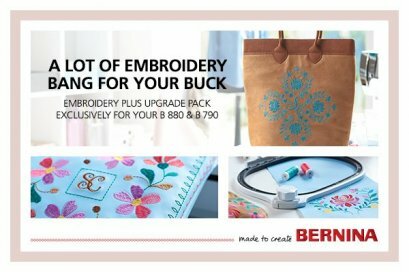 New embroidery features, new embroidery designs and the new BERNINA Midi Hoop are included. A product key comes with the upgrade package, which makes it easy to download the newest features. Place your design on the fabric exactly where you want it. No need to use the template. Easy to use: select two points and match them with the markings on the hooped fabric. Get perfect results quickly and accurately. Undo and Redo while editing or combining designs to return to your initial position. Group and Ungroup designs to edit all at one time. Break apart designs to edit individually. Rearrange the design layer stitch-out sequence. Use rearrange in combination with the group function. The new Midi Hoop makes hooping easier than ever before thanks to the ergonomic twist-lock mechanism. Easily tighten the hoop and get full, even tension on the fabric with just a minimal twist, guarenteeing quick and perfect embroidery performance. The size is 10.5 x 6.5 inches - slightly larger than the Large Oval hoop. Thread Away Mode pulls the threads down to the underside for clean embroidery results on the top. Program jump stitch length to manage thread cuts. Invisible & Smart Secure: Stitches become invisible as the tie-on/of stitches are sewn in stitch direction. Smart secure adds tie-on/off stitches to a design if none are preset. Dozens of new embroidery designs, including monograms with frames, in-the-hoop projects and special technique designs. Includes nine newly digitized embroidery alphabets such as Curly, Happy Times, Deco, or Rounded. Embroidery Consultant for each embroidery technique to help you choose the correct foot, needle, thread and stabilizer according to your fabric so you can achieve the best results. The embroidery design size and the hoop dimensions can be shown in millimeters or inches.